(Office of Her Majesty – Press Department – Amman) Her Majesty Queen Rania Al Abdullah paid her condolences to the families of the three Jordanian intelligence service officers, and two other employees of the service, who lost their lives in a terrorist attack on a general intelligence center in Al Baqaa, north of Amman on Monday. The shooting attack happened at the intelligence offices located near Al Baqaa refugee camp, which was set up after the Arab-Israeli war of 1967, and is the country’s largest camp. 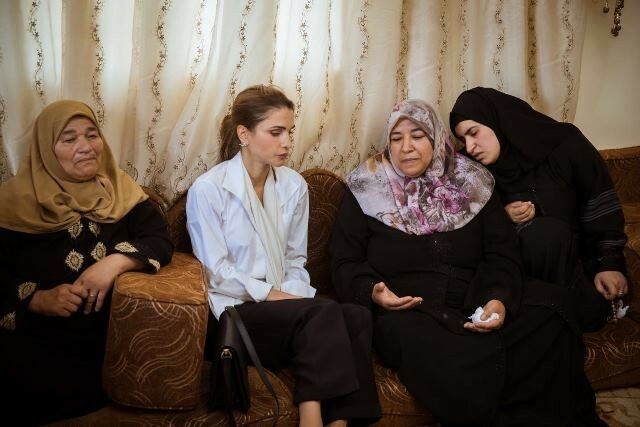 Queen Rania visited each of the family homes of the five victims on Tuesday and Wednesday, offering her deepest sympathies and support to the families after the tragic incident, which shook the nation on the first day of the holy month of Ramadan. The five slain security personnel were Sergeant Loay Al Zyoud, Corporal Hani Al Qaaideh, Corporal Omar Al Hiyari, Private Ahmad Al Harahsheh and Lance Corporal Mahmoud Al Awamleh. On Monday morning, Queen Rania commented on the attack via her official Twitter account saying: "at the start of the month of giving and mercy, a despicable act of terror has taken the lives of five of Jordan's sons. We offer our condolences to the nation, and call on God to grant the families of the martyrs of duty patience and relief." The Queen has repeatedly and passionately spoken out against violent acts perpetrated by terrorists, and has highlighted her gratitude towards those who have dedicated their lives to defending the nation, and keeping its citizens safe. Earlier this year, Queen Rania published a video on Facebook to mark Mother’s Day and Al Karama Battle, commemorating the important battle and the “sacrifices made by our soldiers in honor of our country,” while paying tribute to the mothers of Jordanian soldiers. According to an official statement by the Jordanian government, Monday’s attack was an isolated and individual act. The government also said that the primary suspect had been arrested on Monday evening. On Tuesday, His Majesty King Abdullah reiterated his confidence in the army and security agencies, praising their pivotal role in protecting Jordan’s stability and security, and expressing his condolences over the death of the five men. The heinous criminal attack, which took place on the morning of the first day of Ramadan, Islam’s holiest month of the year, drew wide international condemnation. Several world leaders personally called His Majesty and issued statements condemning the attack and expressing solidarity with the kingdom in facing terrorism, fighting extremism, and preserving security and stability in the world.